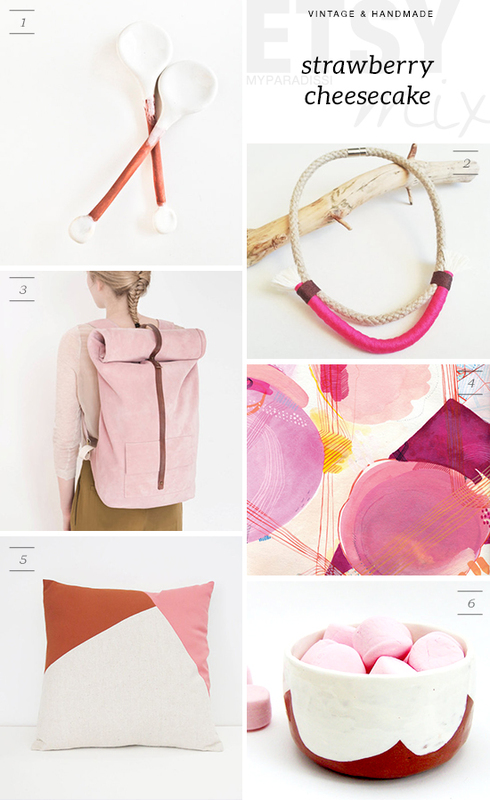 I was meaning to do a more colorful etsy mix post today, but there were so many pretty pinks, fuchsias and neutrals coming on my way that I totally changed my mind. I'm thinking that, for a person with synesthesia, today's collection must be tasting something like strawberry candy, cream or butter biscuits. However, instead of eating up the whole bunch, I'd rather toss this geometric pillow on my couch or sport that sophisticated pink suede backpack! Would you pick anything from this list to taste? 1 comment on "ETSY MIX: Strawberry cheesecake "
Hi, I just saw that you mentioned my neon pink&brown statement necklace on your wonderful blog. (I should check my Etsy stats more often ;) Ευχαριστώ, Eleni!